When I go shopping I try really hard not to buy things like pancake syrup. We have people in our home who are suffering from/trying to manage prediabetes so it feels like a betrayal buying sugar water! There are times though, especially on weekend mornings, that I feel like treating the little kids in our family to a special brunch. They have perfectly normal metabolisms and run it all off so I feel pretty ok with it although its not like I am feeding them white bread. So, this usually leaves me with a conundrum, breakfast treat but no syrup. 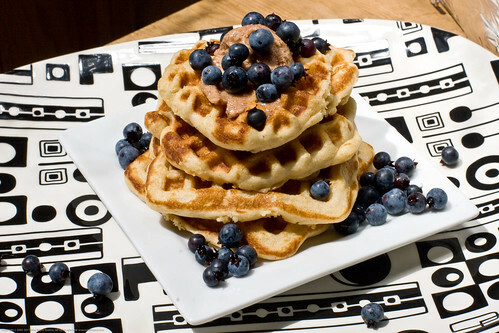 Sometimes I stew some fruits and serve whole wheat pancakes with a fruit compote – very delicious. I have been exploring an alternative to this which is a bit easier and brings a different flavor profile to it. Land O Lakes sent me one of these tubs and also this cute waffle iron, spatula, and cute little knife. 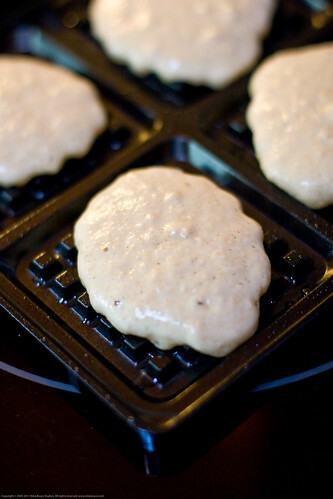 I made some whole wheat waffle batter and poured it on the oiled hot waffle iron. 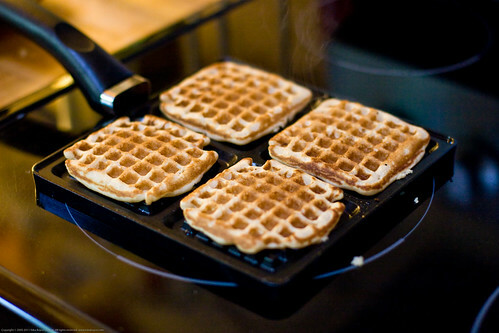 Once they cooked on one side I loosened the waffle-ettes and then flipped them over. 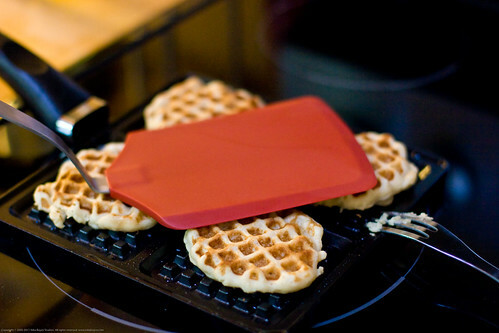 At first I was skeptical about this waffle iron but it actually works and takes up really no space compared to a waffle iron that hogs space on the countertop. While I was cooking, I sent the little kids out into our backyard to the big patch of wild blueberries to pick as many as they could stand. 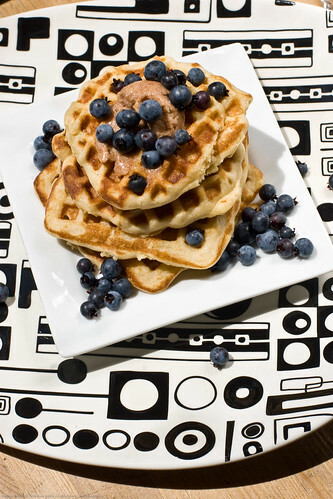 Once the waffles were made and the kids had come back inside, I slathered the waffles with cinnamon butter, stacked them, added wild blueberries, called the kids to the dining room, stood back, and watched them enjoy! I added some honey for one of the kids who is absolutely addicted to it. 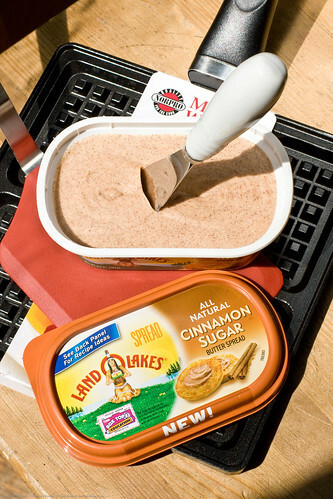 This cinnamon butter is also great on school mornings because instead of really messy though delicious cinnamon toasts that get cinnamon sugar all over everything, this is spread on your toast or bread and stays on. BE SURE TO LEAVE YOUR EMAIL WHEN YOU COMMENT OTHERWISE I CAN NOT CONTACT YOU IF YOU WIN. When the contest period is over, I will count all the entries, chronologically, and then choose the winner using a random number generator! Follow Land o Lakes on Twitter! I’d like to see either a rosemary butter(savory) or a strawberry butter(sweet). Dazed1821 at aol dot com. I would love to see a garlic butter! I’d like for them to do a garlic parmesan spread. How about apple butter – yum!